We have become aware of others unlawfully infringing on our copyrighted and trademarked content to promote their own lock and key parties and websites. We know that this is a great party and others want to try it, but we caution anyone attempting to use any part of our creative materials to promote their own party. Those parties will be shut down and we will prosecute any continued infringement or misuse of the written content and images in this website, our emails or other promotional and advertising resources that we utilize. We are open to working with others in approved partnering arrangements, but infringement will not be tolerated. "Lock and Key /Lock & Key /Lock N Key " is a federal registered trademark of our business, Lock and Key Events, Inc. Further information is available at the U.S. Patent and Trademark Office's web page. Our federal registration of this trademark provides us with certain proprietary rights. This includes the right to restrict the use of the trademark, or a confusingly similar trademark, in association with confusingly similar products or services. This federal trademark serves as an important and distinctive representation of the origin of our products as well as the goodwill of our company. Lock and Key Events are the interactive and FUN way to network, meet your match, make new friends....or just to have a great time! 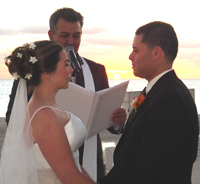 We hold events Nationwide with the currently scheduled parties above. Be sure to get on our email list so we can notify you of the next party in your city! CHECK OUT SOME EVENT PHOTOS! South Florida Lock and Key Events Success Story !!!! Harrisburg, PA Lock and Key Events Success Story !!!! Big news! I wanted to let you know that Julie and I got engaged New Years Eve! We plan to marry on 8/5/06. Just wanted to let you know and say thanks again for providing the opportunity for us to meet (Lock & Key Apr04)! Remember, if you need any help/endorsements for future events, just let us know. Philadelphia Lock and Key Events Success Story !!!! I just turned 29 years old and am happily married to my best friend and soulmate! My husband and I met at one of your Philly Lock and Key events almost 5 years ago and it was one of the best nights of my life! It was the first and only Lock and Key event that I ever went to and I am so happy that I went to it that night! We have now been married for 2 years and we have a beautiful baby boy together and he just lights up our lives each and everyday! I love reality TV, sour patch kids, shoes, coach bags, the Jersey Shore, and gum! 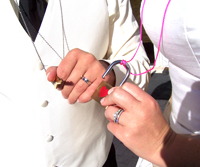 I wanted to start running Lock and Key Events in the Pittsburgh area because my husband and I want to show everyone out there that it is possible to fall in love in this busy world of ours! Casey is now our Pittsburgh Event Host! Hired in 2008 !! New York City Lock and Key Events Success Story !!!! Just wanted to let you guys know that both Jay and myself are now off your mailing list. We met at the March 28, 2008 Lock and Key Event in NYC. We went on our first date the following weekend. Since then, I've fallen love with the most incredible woman in the world! 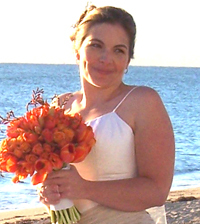 In February 2009, I took Jay for her birthday to Puerto Rico. While down there, I asked her to marry me. 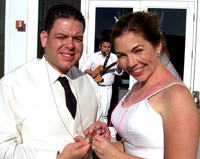 We got married the next day (Feb 4th 2009). Yours was the first picture of us. Charlotte, NC Lock and Key Events Success Story !!!! ENGAGED ON DECEMBER 23RD, 2009 !!!! I met Patrick at a Lock and Key Event in Hollywood at Pangaea Lounge almost 7 years ago. It was April Fool's Day, 2006. We soon became "Fools in Love" and the rest is history as we were married just over 7 months after meeting at your event! We have Lock and Key Events to thank for it!! Check out the cool tattoos we each got to remember how we met. We hope you like them!